Click here for a link to ongoing research in this laboratory. 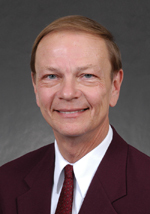 Dr. Vedeckis obtained his Bachelor of Science in Biological Sciences from Loyola University in Chicago in 1970. His Doctorate in Biological Sciences was awarded in 1974 from Northwestern University in Evanston, IL. From 1974 to 1979, Dr. Vedeckis was an NIH postdoctoral fellow in the Department of Cell Biology at Baylor College of Medicine in Houston. During this time he began his research on the molecular mechanism of steroid hormone receptor action. Since 1979, he has been a faculty member in the Department of Biochemistry and Molecular Biology at LSUHSC in New Orleans.